As we are about to welcome a new lunar year of the Fire Monkey, I have definitely been seeing firey yellow...and what better colour to begin the year with a positive bang. Rather than making a wish list, this year I am considering the Qipao (or Cheongsam) styles that can be a true contender in a girl's daily wardrobe. For why only wear the Qipao for Chinese New Year, when you can wear it any day you want! 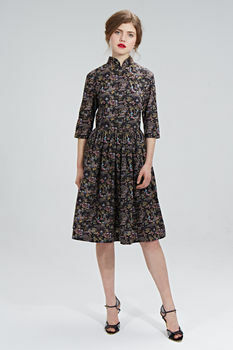 'Garden Party Dress' by Mrs Pomeranz makes it in my top Cheongsam pick for 2016 as a unique blend of vintage 1950s style and East meets West love story. The Liberty of London fabric by designer Anna Sui is named Peony Pavilion and crafted by Mrs Pomeranz. Reminding one of the love of mandarin collars and Cheongsam during the 50s, but bringing it up to date with unconventional print and colour. Not the easiest to wear, but if you can pull it off in vintage style fluffed petticoat or as an edgy modern statement then it is definitely one to turn heads! 'Banana-rama' by The Happy Cheongsam is absolutely adorable...and one I can't resist as being a Monkey who is welcoming a new Monkey year it almost sets out the intention for a fun year ahead. In an easy to wear style that will add to the chest area, create a waistline and skim down the wobbly tummy...this is really a sweet addition to any wardrobe! 'Hsi Shih in Peacock' by Lark & Peony is as groovy as groovy goes! Bringing a wonderful splash palette of blues in a print nodding towards the 1960s to 1970s matched with a softly relaxed but decent height mandarin collar. Just throw on a sharp black blazer and accessories....easily fits into a daily wardrobe staple and one to cheer yourself up on a dull day! 'Hermes Silk' by Eve55 reminds one of the daffodils in spring with a beautiful yellow, but add in an eclectic mix of new world fashion accessories print. Almost like marrying modernity to the classic Qipao shape in luxurious silk, which makes it an easier piece to wear for a day at the office or even afternoon tea out with the girls. Just don't forget those statement heels and power bag! 'Peony Blossom' by All About 8 is a vibrant two piece that brings the bloom of a prosperous new year to any wardrobe. Peonies being symbolically elegant and noble adds meaning to your new style journey into a new year. Pretty enough to be worn as a whole feminine modern styled Cheongsam dress, and practical enough to wear either as a separate skirt or top to brighten a more wishful day after the new year! All in all I am getting excited for the arrival of Chinese New Year of the Monkey....on Monday 8th February 2016. But it will definitely be a year of changes, as one of my good friends Naoko is getting married, whilst my vintage partner in crime Rachael is sadly moving back to Canada. So deciding not to do my annual vintage tea, I will still be spotted in my Qipao (Cheongsam) over the 15 day Chinese New Year festivities!